More Than Just A Toilet. Here at Orchid Bathrooms our choice of WCs is unrivalled, from space-saving wall-mounted options, to back-to-wall and close-coupled toilets. Combined toilet and bidet units (Shower toilets) offer a unique cleansing experience, a true reinvention of the conventional WC. The classic WC, a close-coupled toilet comprising of a cistern that sits directly on top of the pan, which is fitted to the floor. The close-coupled pan is therefore one complete unit. 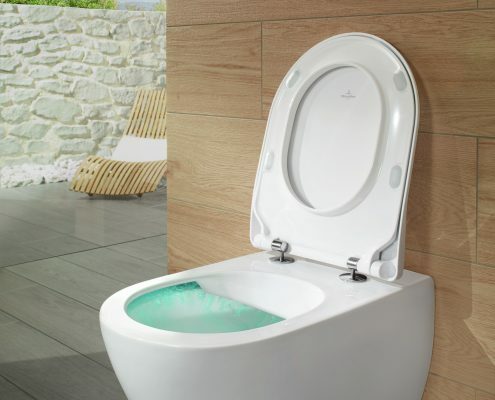 The pipes connecting the cistern to the bowl are concealed within the toilet, giving it a sleek finish. We have an extensive choice of close-coupled pans, ranging from streamlined, contemporary toilets, to traditional designs with period detail. A back-to-wall WC is designed to maximise space within the bathroom and present a sleek finish. Back-to-wall toilet pans are placed against a furniture unit or bathroom wall, with the purpose of encasing the cistern and piping to conceal them from view. This allows for clean, minimalist lines and increased floor space. A wall-mounted toilet is hung on a concealed frame, allowing a tiled floor to be fitted flush to the wall. The cistern is also concealed behind the wall. This creates a feeling of space, and makes the room easier to clean. Given its compact size, it’s an ideal choice for smaller bathrooms, en-suites and cloakrooms. 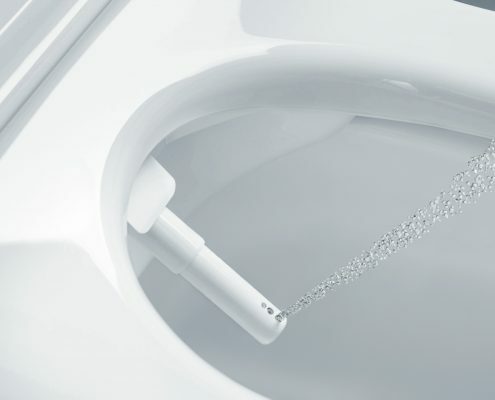 High-tech combined WCs and bidets offer a new standard of cleanliness, redefining comfort, hygiene and quality of life. Warm jets of water can be adjusted to individual preferences from a simple remote control or by the touch of a button. Other features include warm-air drying, seat heating and odour extraction systems that eliminate smells before they spread. The naturally curved shapes of the washlets mean that they blend in harmoniously with a range of bathroom styles.